to buy more corn to feed her pigs. She will also buy metal mesh to be repair her pigs pen. Sindy Marilú benötigte 400 US-Dollar, um ein Gewerbe im Bereich Landwirtschaft auf- oder auszubauen. Das Geld wurde gesammelt und für Sindy Marilú bereitgestellt. Sindy studied up till the 3rd grade at school. She is part of a couple and her partner works in agriculture. She has two underage children. 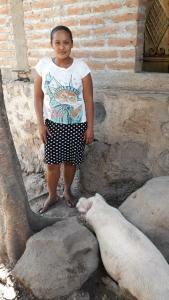 Sindy has been raising and selling pigs for the last four years. She learned her skill from her mom who was in the same trade. Her pen is located by her home. She also prepares and sells tortillas. She needs this loan to buy corn to feed her pigs. She would also like to buy metal mesh to repair the pigs pen.